This is going to rock. 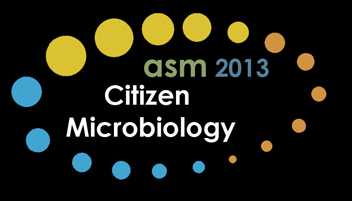 Citizen microbiology – highlighted at the American Society for Microbiology Annual Meeting in Denver in May. The details on the session are below. Sunday May 19 at the American Society for Microbiology General Meeting in Denver. If you are interested in attending Register here. If you work on some aspect of Citizen Microbiology please consider submitting an abstract for a talk or poster. The deadline is January 15 17. We will highlight ALL accepted abstracts in some way both during the session and in blogs, tweets, interviews, etc. So please consider participating. Citizen Science is a valuable way to both generate scientific data and to engage and educate a broad audience. Some areas of biology such as astronomy and ornithology have conducted multiple successful citizen science projects over the years. Surprisingly, there are not many citizen science projects in microbiology even though microbes are of interest to the majority of the public, as well as being tractable for these kinds of studies. This session will focus on citizen science in microbiology. This session will examine the diversity of Citizen Science projects, outline what makes a successful project, and highlight examples of past, current and future Citizen Microbiology projects. Speakers will also provide details on overcoming challenges in Citizen Science (e.g., visualization, permissions, privacy, standardization, informed consent). Our belief is that more projects, throughout the different domains of microbiology, could benefit from incorporating a citizen science component. Having this session at the General Meeting will help bring together people interested in this topic, as well as fostering collaboration on existing and future citizen science projects. Sunday May 19 at the American Society for Microbiology General Meeting in Denver. Register here. More on Citizen Microbiology can be found here. So I guess I remain unclear—abstracts can be considered for talks or posters? I don’t know if you are “full up” with folks giving talks at your session. Appreciate the comments!